Apple will ditch the home button when it debuts a new 'iPhone 8' model later this year, and will dedicate the extra screen real estate to an area for virtual buttons, according to KGI analyst Ming-Chi Kuo. Adding detail to his previous predictions regarding the next-generation handset, Kuo in a note to investors obtained by AppleInsider said the full-screen design will allow Apple to integrate a "function" area never seen in an iPhone. The device is expected to adopt a 5.8-inch OLED panel in a form factor similar to the current 4.7-inch iPhone 7. Despite having extended screen real estate as compared to current iPhone models, the actual active display area on "iPhone 8" will be closer to 5.15 inches on the diagonal, with the remaining bottom portion dedicated to system functions like virtual buttons. 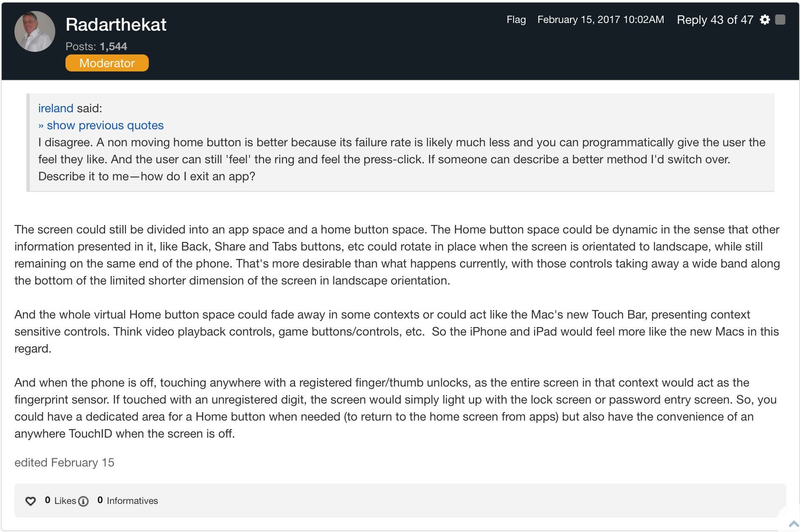 While Kuo failed to elaborate on an exact implementation, the note suggests Apple plans to hardcode a set of always-on, static system controls into iOS. Whether the so-called "function area" is capable of switching to an active display mode for in-app activities like watching videos or playing games, remains to be seen. Kuo's predictions jibe with a The New York Times report last year claiming the next iPhone will boast virtual buttons instead of the usual physical controls. With the deletion of current Touch ID technology, Kuo believes "iPhone 8" will incorporate new bio-recognition assets to take over device security and Apple Pay authentication duties. Apple introduced Touch ID fingerprint recognition technology with iPhone 5s in 2013, later expanding its use to all iPhone and iPad models. Most recently, the company brought Touch ID to Mac with the 2016 MacBook Pro with Touch Bar. The analyst did not offer predictions on the type of biometric tech Apple intends to use, but a report earlier today said the company could integrate a 3D laser scanning module capable of facilitating facial recognition and augmented reality applications. Kuo in a note last month said Apple might integrate a dual biometric system utilizing optical fingerprint readers and facial recognition hardware. While speculation, Apple will likely integrate some flavor of finger scanning tech in its upcoming flagship, perhaps accompanied by a secondary form of authentication. Though it might not feature the same capacitive sensing equipment, the Touch ID brand is expected to live on. Coincidentally, Apple this week was granted a patent covering a micro LED display capable of detecting touch events and user fingerprints with specialized infrared diodes. Invented by Apple acquisition LuxVue, a small company specializing in power-efficient screen technology, the IP contains contingencies for application in OLED displays. Kuo goes on to estimate an "iPhone 8" price tag starting at $1,000, reiterating a figure first divulged in a report this month. The price hike is attributed to a 50 to 60 percent bump in production costs compared to the anticipated "iPhone 7s" LCD models. In a separate note sent out on Wednesday, Kuo reiterates earlier predictions regarding Apple's use of a stacked logic board, called a substrate-like PCB mainboard. Stacked SLP arrangements afford more internal space for a larger battery and other integral components, while maintaining a thin overall form factor. So would this area function like a second screen, similar to (but with more functionally) than the second screen on the LG phone? When watching video would it extend into this area? Like a short version of the new MacBook Touch Bar... including the ability to thumbprint ID anywhere in the function area. Cool! I've been suggesting Apple go this. It always seemed like a great idea to me. Taking the new buttonless MacBook touch pad to the next level. i wouldn't doubt that this was the idea all along since before the buttonless MacBook, as we already see a much simpler extrapolation of this on the iPhone 7. Is it really too much to ask that you include the word "Rumor" or similar language in your headline? Because that's what this is. Ming-Chi Kuo was *way off* on his last round of predictions, though he has made some good guesses in the past. Please stop stating speculation as fact in headlines. Journalism 101, guys. The headline reads like the columnist actually knows what he's talking about, which is misleading, because he doesn't. This is just repeating more uninformed speculation, something we now call fake news. The headline tricked me into reading a worthless piece of drivel, and I feel the writer owes me an apology for wasting my time. - Fingerprint sensor is part of the second OLED screen. I don't think it's possible to have a sensor included within a display without it affecting the image (for example, reducing brightness). This would increase cost/complexity to have it perform as good as a screen without a sensor. - Since the small OLED is the Home button, it's going to see a lot more usage/stress than the main screen does with 3D Touch. This might be where the flexible OLED comes in. Not to make a curved screen, but one that flexes slightly from simulated "button presses". Reduces stress on main screen and can be replaced easily for warranty/repairs. - Maybe an always on display for time or other simple notifications on this separate screen. - Of course, all the stuff we see with the Touch Bar on the Mac. I'm not sold on this rumour. I like having a physical indention for the Home Button. However, like with the virtual keyboard, if it can lead to a plethora of additional features, utilities, and efficiencies because it's been removed then I could be swayed. I've been wishing for this for years, ever since the 4. I always thought the home button ate up way too much space. But replacing it with a dead (ie: no active screen) function area makes no sense. They might as well keep the physical button. It would be great if they could just move the home button to the side and make the phone smaller but with the same size screen. So they are going to put a bar just like in the MacBook Pro? Interesting idea! I can roll with that. They could put it on the back, like lg did . I used an LG phone that a friend has and it felt pretty natural with the bottom on the back. Yes not only is this going to resemble touchbar, but it will be used as scrubbing and scrolling through pages as well. It will be similar to the touchpad. #FAIL. I, along with other expert tech industry prognosticators and pundits, were expecting a 5.16" display, not 5.15". Thus, I recommend everyone SELL their AAPL positions, and run from the company immediately, as far away as possible. That would decrease views which decreases revenue, look somewhere else for journalism. "While Kuo failed to elaborate on an exact implementation, the note suggests Apple plans to hardcode a set of always-on, static system controls into iOS. Whether the so-called "function area" is capable of switching to an active display mode for in-app activities like watching videos or playing games, remains to be seen." I agree in theory but not in practice. I'm tired of going to rumor sites 6 months in advance of the actual product release and having to disseminate the actual rumor because the headline writer is forced to produce linguistic gymnastics in order not to get sued, misinterpreted as gospel or any other confusing interpretation of he story. I'm on a rumor site so tell me the rumor as if you're the guy telling me an exclusive at a party or even in confidence. Even if people do believe this rumor is 100% true, they cannot act upon it so it presents no actionable or illegal consumer product issue to anyone. It's simply fan fiction for now. We're all adults so why not distill stories down to their core and not their literal truths? That would be a job for editorials and opinion pieces, not regurgitated telephone game. Telephone game is fun but no one at the end of the line expects the truth for that is the real fun. As far as practice, I suspect its mostly to maximize SEO with Google. Use any words like "rumored" or "reported" or "believed" in your headline and you're fighting a million other rumor headlines and not the news. This might be a form of click bait by some standards but it is not the same as fake news. Wake me up when the headlines really fool people just before a product is actually released. Please don't reference the election in any way in your reply. Thanks. That 5.15 inch display would be a disappointment. It would shrink the usable screen from the current iPhone 7+ form factor. If this rumor is correct it is $1000 for a phone with a smaller usable screen. It will be awesome. It always looked like a big waste of space to me for it to just be one button on the center and nothing else left or right of it. and as someone else said, if oled were difficult to acquire in such quantities or too expensive, just the bottom bar being oled alone would save a lot of battery life. but for me it always seemed like a godsend opportunity for scrubbing through text alone. hope this comes about because it's been long overdue. I was expecting 5.15589" not 5.15000" but I would see how this turns up.